Escapade Games Announces Release of Riftwalker! You may have noticed that the Growing Up Gamers blog has been on hiatus. Sorry! The primary reason is that Angie and Julian have been busy designing games. The exciting news we have is that their newest game, Riftwalker: A Storm Hollow Card Game, has been delivered to Kickstarter backers and is now available at retail! Isn't that exciting?!? 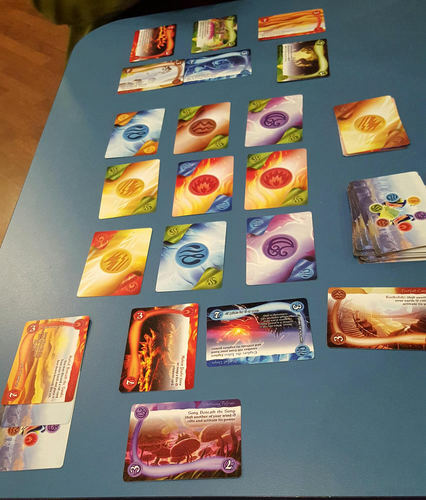 Riftwalker is a strategic card game for 2-4 players. The players take on the role of a Riftwalker, one of the iconic heroes of Storm Hollow, as they explore the fantastic locations of the world. 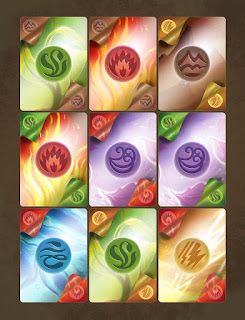 Manipulating the element grid to draw on the magic of Storm Hollow is necessary to explore and activate the magic of the land. For a pretty good overview of the gameplay, take a look at this video from Bonding With Boardgames. 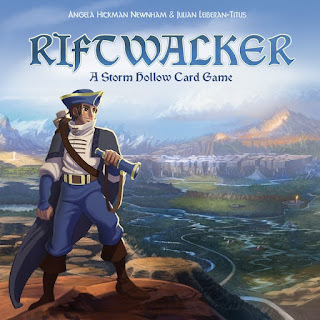 Find Riftwalker: A Storm Hollow Card Game at these retailers & more! Has anyone had the opportunity to play it yet? If so, let us know! Additionally, feel free to post reviews! Winners of the Riftwalker Giveaway! It's time to announce the winners of the Riftwalker Giveaway! We'd like to thank everyone who took the time to enter & help us spread the word about Riftwalker: A Storm Hollow Card Game. With your help, we were able to help get this game funded. And we are very grateful. Look for a retail release of Riftwalker later this year! Well... here they are: the winners! 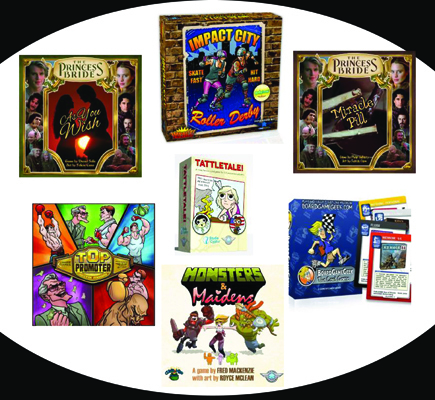 The winners have all been contacted, in order of drawing, and have each chosen one of the excellent games that Game Salute so generously offered for the giveaway. We'd like to give a big shout-out to Game Salute for doing this. Again, we would like to extend our gratitude to everyone involved.Thank you! Dear Hearthstone Players: Please Learn Some Dang Manners! 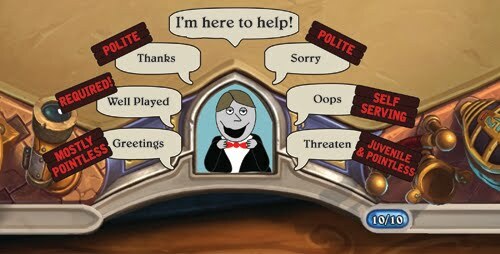 One of the greatest features of Hearthstone (an incredible online collectible card game you should check out if you haven't) is that it limits the online talk of its players to six straightforward emotes: Thanks, Well Played, Greetings, Sorry, Oops, and Threaten. It’s simple but effective communication that makes it easy to display good game etiquette. Of course, you still have to have some idea of what good game etiquette actually IS. After playing this game for quite some time, it’s clear that many of you missed the day (or the entire childhood) where they were teaching this stuff. Never fear, my friends. I am here to help you with a breakdown of each emote and how to PROPERLY use it. Pay attention, whipper-snapper! I’m about to teach you some manners! This is the polite and proper response when someone says or does something nice for you. In Hearthstone, this should follow any time your opponent uses the “Good Game” emote to compliment you on your play. Also, appropriate (but not necessary) if an opponent plays a mutually beneficial card that does something fun or cool for you, too. Do NOT use this emote sarcastically to whine at your opponent when they destroy your favorite creature or wipe your board. That’s petty. This emote is mostly pointless. You can say a generic greeting at your opponent at the start of the game to say hello, but after several games this starts to get old. It doesn’t really show appreciation in any meaningful way. However, if your opponent is taking a long time on their turn and doesn’t seem to be doing anything, you can give a single “Greetings” to check that they know it’s still their turn. Also, pointless though it may be, if someone greets you at the start of the game, you GREET THEM BACK. That’s just common decency. It can be tempting to say sorry when you destroy your opponent’s board or otherwise swing the game strongly in your favor. Don’t. It’s a competitive game. Everyone gets that. Apologizing for playing effectively is just condescending. That said, Hearthstone has a lot of cards with random effects that sometimes swing the game in unfair ways. When a random effect unbalances the game in your favor, a sympathetic “Sorry” is a good way to indicate that you know you’re not about to win due to any particular skill or strategy on your part. Also, “Sorry” is a fine way to express sympathy if your opponent makes an obvious misplay and calls it out by pressing the “oops” emote. What are you 12? Obviously you shouldn’t threaten people you’re playing a game with. True, the threat emote is too ridiculous to be threatening. However, it’s not ridiculous ENOUGH to be ironic or funny. It’s just juvenile and pointless. And when you press “Threaten” after losing a game, what is that about? Do you think you’re the villain in my hero’s story and that’s your dramatic finish? Well it’s not. It’s dumb. Grow up. Speaking of fun things to play, Growing Up Gamers is running a contest where you, yes YOU, can win free games! It’s all to promote our Kickstarter for Riftwalker: A StormHollow Card Game going on through Sunday, March 20th. You can check out the contest here! The Kickstarter is also promoting the last few weeks of Storm Hollow pre-orders. This awesome storytelling adventure game represents four years of development by the Growing Up Gamers crew (and other amazing people who helped out). There are no immediate plans for a retail version so preordering may be the only way to ever get this fantastic game of which we are incredibly proud. It will only be available for purchase in its current format until March 20th. You can check out the pre-order here! Escapade Games Launches Riftwalker on Kickstarter! Plus a Giveaway! Great news! 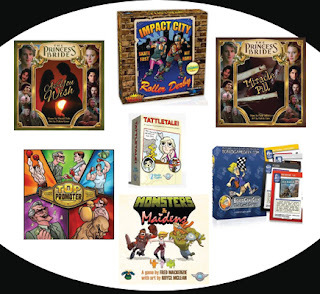 Escapade Games, the game design studio consisting of Angela Hickman Newnham and Julian Leiberan-Titus of Growing Up Gamers, have a new game on Kickstarter! Riftwalker: A Storm Hollow Card Game is a small strategy card game where players take on the role of one of the hero types of Storm Hollow, a riftwalker. Riftwalkers explore the world, discovering rifts, pieces of other worlds that have been transported to and make up the world of Storm Hollow. These heroes are in tune with the world and can draw upon the magic of the world to do amazing and heroic things. Here's a video showing how the game works. And here's a review by Jonathan Liu of GeekDad! Speaking of Storm Hollow, the game will be shipping to backers later this year. 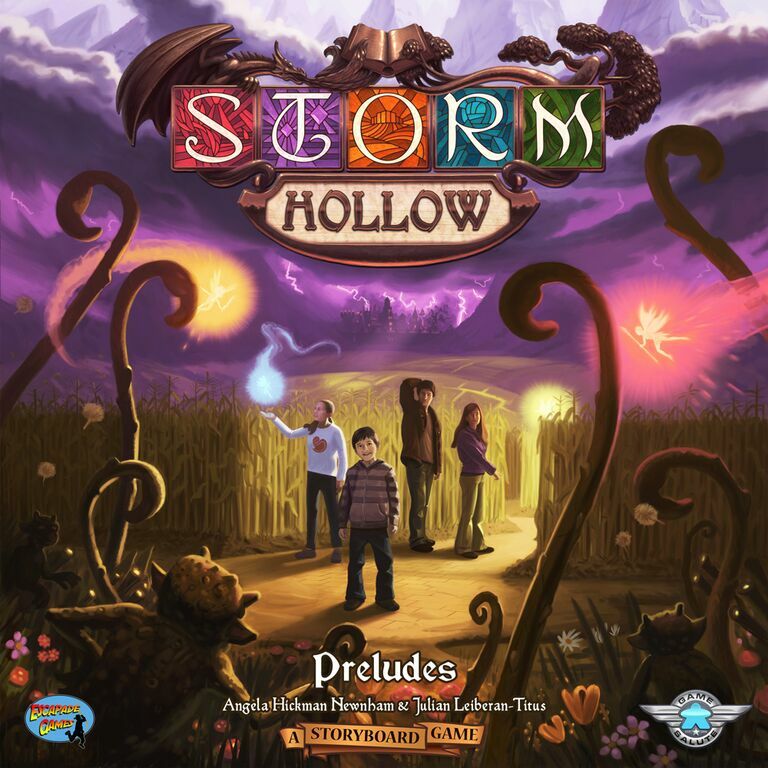 Storm Hollow: A Storyboard Game is a storytelling game with simple mechanics that the whole family can enjoy together. While the retail strategy has yet to be determined, the Storm Hollow Limited Edition Treasury is available for preorder. It's an amazing amount of content, and the only way to guarantee getting a copy is through this limited-time preorder. The world guide is available as a free PDF download, if you want to get a preview of what's in store! Seven games and seven winners! To enter, do one or more of the things below. And you can get extra entries daily! Please spread the word!